Fenway Health's LGBT Aging Project Receives $100,000 Cummings Foundation Grant | Fenway Health: Health Care Is A Right, Not A Privilege. Fenway Health’s LGBT Aging Project Receives $100,000 Cummings Foundation Grant | Fenway Health: Health Care Is A Right, Not A Privilege. Fenway Health’s LGBT Aging Project Receives $100,000 Cummings Foundation Grant – Fenway Health: Health Care Is A Right, Not A Privilege. The LGBT Aging Project at Fenway Health is one of 100 local nonprofits to receive grants of $100,000 each through Cummings Foundation’s “$100K for 100” program. The Boston-based organization was chosen from a total of 597 applicants, during a competitive review process. Cummings Foundation has announced a total of $20 million in grants to Greater Boston charities in the past two months alone. The LGBT Aging Project is dedicated to ensuring that lesbian, gay, bisexual and transgender (LGBT) older adults have equal access to the life-prolonging benefits, protections, services and institutions that their heterosexual neighbors take for granted. Lisa Krinsky, LICSW, Director of the LGBT Aging Project, and Bob Linscott, the program’s Assistant Director, will join approximately 300 other guests at a reception at TradeCenter 128 in Woburn to celebrate the $10 million infusion into Greater Boston’s nonprofit sector. With the conclusion of this grant cycle, Cummings Foundation has now awarded more than $220 million to Greater Boston nonprofits alone. The grant will fund Bringing LGBT Aging Out of the Closet, an initiative that will enable the Aging Project to build on and expand its LGBT cultural competency training, with particular attention to educating mainstream older adults on LGBT issues, and a broad array of audiences on transgender aging. This year’s diverse group of grant recipients represents a wide variety of causes, including homelessness prevention and affordable housing, education, violence prevention, and food insecurity. Most of the grants will be paid over two to five years. 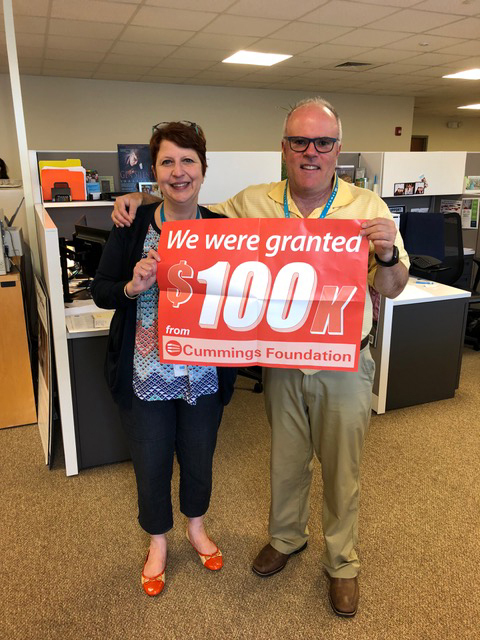 The complete list of 100 grant winners will be available beginning June 7 at www.CummingsFoundation.org. Want to receive email updates about what’s happening at Fenway Health and AIDS Action? Sign up here.